From 1979 Red Star ran a fortnightly Cinema at the Netherbow on Edinburgh’s High Street (now the Storytelling Centre). The loose collective included Wilson Smith, Dave Nielsen, Ian Currie, Ruth Mcilroy, Alan Robinson and Dave Rushton. Red Star was established with funds from School Press, a small left-wing printers based at the Trades Council in Edinburgh. Red Star began by covering demonstrations and labour movement activities missed by regional TV. With TV news crews on Saturday’s devoted to filming football there was sparse coverage of the massive and numerous marches and demonstrations happening monthly and sometimes weekly in opposition to Trident, to privatisation, to US intervention in South America, to factory closures and to attacks on public services. There were demonstrations in Glasgow in support of political status for prisoners in Northern Ireland’s H-Block, with opposition from the British National Party and more extreme elements of the Orange Lodge at demonstrations held in Edinburgh. After a year or so Red Star began making documentaries, first on the workers’ film movement of the 1930s, then on the opportunities presented to government from preparations for a post-nuclear war administration. Filming took place to identify the extensive network of nuclear war preparation sites across Scotland, then being picketed by local CND groups. Funding in the early 1980s for unemployed workers’ and trades’ union resource centres encouraged rank and file and union media production. Light-weight video cameras and recorders became available in the 1980s so by the end of the decade those once active in Red Star had moved on to video and to distribute films on VHS tape. 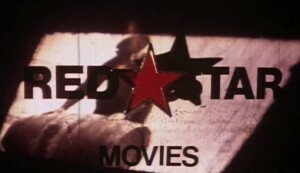 A number of Red Star films can be found on the Summerhall TV Archive on summerhall.tv.